Orange Mint tends to be stronger in flavor than many of the other mints. Orange Mint leaves give off a citrus and spice flavor. With almost unlimited uses, use your Orange Mint leaves in iced tea, fruit desserts, fruit & grain salads, dressings, vinegar, jellies, sauces, ice cream, and creamy desserts such as creme brulee. Orange Mint is one of the ingredients in Chartreuse liquor, an herbal French liquor made from 130 different herbs, plants and flowers. Mentha x piperita x citrata (Orange Mint) produces white to pink blooms that begin to appear around mid to late summer attracting bees and butterflies. 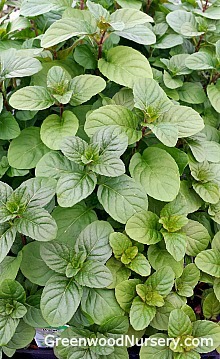 As with other mints, Orange Mint is an aggressive growing plant and should be contained so it does not take over the neighborhood. Orange Mint ships in 3.5 inch pots. Plants shipping to CA or AZ will be root washed before being prepped for shipping.